I grew up on the coast. On sunny days, which aren’t that common in Southeast Alaska, you could watch from the living room the sailboats as they whipped up and down the channel. I remember watching them as a child. There was a large marker warning people that there was a shoal, but people often ignored it during sailboat races and so, once in a while, a boat would end up stuck in the mud until high tide. None of the boats on today’s paper doll skirt will likely have that problem. 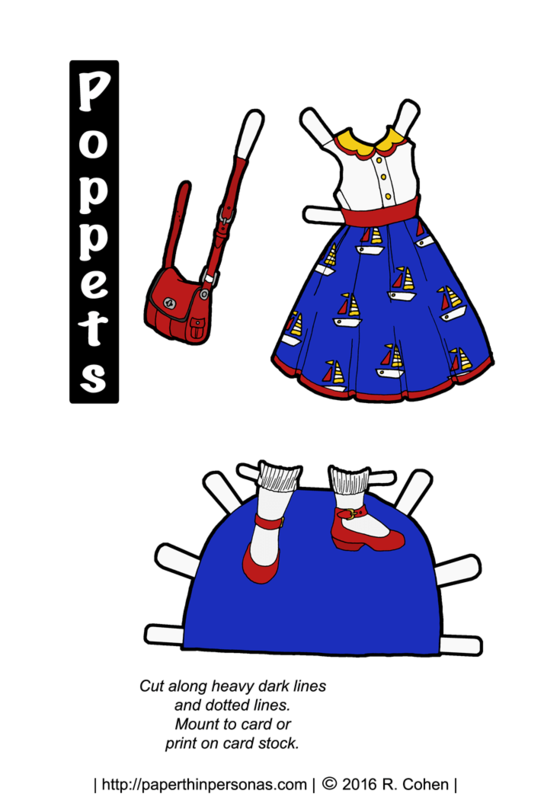 The color scheme of today’s Poppet paper doll dress is based on maritime signal flags. When my father was studying for some sort of nautical exam, we spent time together looking through the signal flags and I’ll always think of those colors when I think of nautical inspired paper doll outfits. When I was studying in England, I got a brown leather satchel, a lot like our paper doll’s red version. I carried it for many years, bit eventually the leather split. I’ve always loved how a nice satchel looks. As always, I’d love to hear that people think in the comments. I like the dress, but I love the satchel. Love the sailboats! This reminds me of a dress my Mom made for me when I was little! It’s adorable, but I’m getting the wrong day for the links;it’s yesterday’s dress. Should be fixed. Thanks for letting me know.